To take your place in life. Skills2Work exists to assist people find their way out of unemployment & poverty. For sincere job seekers, unemployment is a trap which can destroy self-respect, dignity and lead to poverty with its wider implications. Skills2Work exists to assist worthwhile beneficiaries gain tangible, vocational skills and long-term employment. The KickStart programmes include a vocational skills training programme combined with a life skills course. 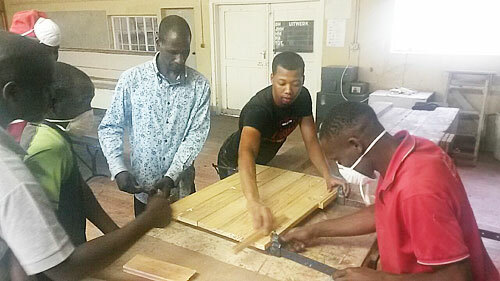 The first 5 beneficiaries of our Carpentry KickStart have just finished the programme. and moved on to specific apprenticeship placements. Since 2015, Skills2Work has been involved in developing small bakery businesses. We have now developed our own Manna Oven design and 'business in a box' concept. Contact us for more details if this is of interest to your church or organisation. Email us to request information about how to assist with current projects, mentorship or training costs. UK and Overseas supporters are welcome to make use of our Stewardship fundraising page. The Skills2Work bakery business model draws upon our experience of other wood burning bakery concepts. We are grateful to DD Manufacture for their expertise and generosity in sponsoring the design of a bespoke and optimised Manna Oven.